Ultra-wideband (UWB) impulse radios have shown great potential in wireless local area networks for localization, coexistence with other services, and low probability of interception and detection. However, low transmission power and high multipath effect make the detection of UWB signals challenging. Recently, multi-symbol based detection has caught attention for UWB communications because it provides good performance and does not require explicit channel estimation. Most of the existing multi-symbol based methods incur a higher computational cost than can be afforded in the envisioned UWB systems. In this paper, we propose an iterative multi-symbol based method that has low complexity and provides near optimal performance. Our method uses only one initial symbol to start and applies a decision directed approach to iteratively update a filter template and information symbols. Simulations show that our method converges in only a few iterations (less than 5), and that when the number of symbols increases, the performance of our method approaches that of the ideal Rake receiver. Ultra-wideband (UWB) impulse radio (IR) transmits ultra-short pulses at low power spectral density where the information is encoded via pulse-amplitude modulation (PAM) or via pulse-position modulation (PPM). The IR-UWB systems show some important merits including: coexistence with current narrowband signals, high multiple-access capacity and fine timing resolution [1–3]. Fine timing resolution property helps the receiver to resolve distinct dense multipath components and provides high degrees of diversity whilst the low power spectral density enables sharing of the RF spectrum with limited mutual interference. One of the major challenges in UWB system is to deal with the dense multipath channel. Indeed, each transmitted UWB pulse arrives at the receiver as hundreds of replicas with different delays, amplitudes and phases [4–6]. To collect the available diversity, Rake receivers [7, 8] employ a large number of fingers to capture the multipath energy . However, channel estimation error can degrade the Rake's performance and the accurate estimation of the gains and delays of channel paths incurs considerable computational cost . As an alternative to the Rake receiver, the transmitted reference (TR) method [8, 11–14] sends a reference signal along with the data-modulated signal. The receiver can simply be an autocorrelation receiver which demodulates the data by correlating the delayed reference signal and the data-modulated signal. The advantage of the TR method compared to the Rake method is that it is easier to implement because it does not require explicit channel estimation. However, the main drawback of TR-based methods is that the noise induced in the reference signal severely degrades the error performance. In , decision-directed autocorrelation (DDA) receivers are proposed to detect the current symbol by correlating the current information waveform with a waveform template generated by all previously decoded symbols. However, the DDA receivers detect the information symbols successively and the current detected symbol has no contribution to the preceding symbol detection. To relieve the noise effect of the reference signal in TR system, further enhancement techniques exploit the multi-symbol differential detection [16, 17] to jointly detect consecutive symbols. The generalized likelihood ratio test (GLRT) approach for the multi-symbol case is derived and exhaustive search is performed on all symbol possibilities to find the optimal one . The practical implementation of the method suffers from the exponential computational complexity in terms of block size . A reduced complexity algorithm is devised in  by introducing the sphere decoding algorithm (SDA). An approximate algorithm based on the Viterbi algorithm (VA) is also presented in . Although SDA and VA reduce the complexity relative to exhaustive search, and are effective for small , they require considerable computational effort when is large. In this paper, we propose a fast multi-symbol iterative detection method. The method harvests the benefits from the concept of the multiple symbols detection and outputs a better bit error rate (BER) performance than the single symbol TR system whilst exhibiting a low computational complexity ( , where is block size and is the maximum number of iterations). Following the description of general iterative method, two particular low-complexity detectors are designed and evaluated in the simulation experiments. 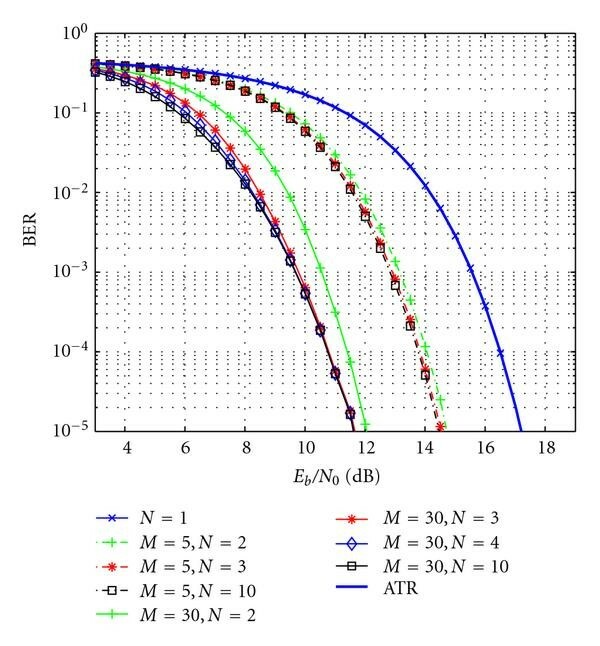 Although the proposed method cannot guarantee to achieve the same performance as the GLRT-based detector in the general case, experimental results show that the BER performance of the method is very close to that of the GLRT when (the signal-to-noise ratio (SNR) gap is less than dB). Further experiments demonstrate that a few iterations ( iterations) are sufficient for the detectors to converge. The rest of the paper is organized as follows. Section 2 introduces the UWB signal model. Section 3 describes the multi-symbol transmitted reference system with GLRT detection. Section 4 develops two fast multi-symbol transmitted reference-based detectors. Section 5 shows the numerical results for a constant channel and random channels, respectively. Section 6 concludes the paper. where is a transmitted monocycle waveform with support set , the 's are the modulated symbols, the 's are the user-specific pseudorandom time-hopping (TH) codes and is its frame duration. Because the energy of one single pulse is limited in UWB communication systems, each symbol is transmitted using frames so that the receiver can collect enough energy to recover the signal. Thus, the symbol duration is . The TH codes are integers chosen from so that multiple users can access the channel concurrently and the transmission time of th monocycle waveform is delayed with seconds. Due to the highly-frequency selective feature of UWB channel, the frame duration is chosen such that , where is the maximum excess delay of the channel. This condition eliminates intersymbol interference (ISI). The energy of one pulse is . where is the channel template, denotes the convolution operation and denotes the noise including multiple access interference (MAI) and an additive white Gaussian noise (AWGN) with zero mean and two-sided power spectral density . The noiseless received signal energy in each frame is defined as and is proportional to the pulse energy . Transmitted Reference (TR)  with = 1 if is even, otherwise = . Multi-Symbol Differential Encoder (MSDE)  with and where is a multi-symbol block index and . Multi-Symbol Transmitted Reference (MSTR) with and where is a multi-symbol block index and . In this paper, our focus is on the MSTR encoder in this paper. All these encoders employ the first modulated symbol as the reference signal in each block and the TR scheme  can be viewed as a special case of MSTR scheme where . For MSDE case, the current transmitted symbols are encoded differentially with the previous encoded symbols and the first symbol is used as an initial symbol, while in MSTR case, the current transmitted symbol is the same as the information symbol except the first one, which is used to generate the reference template. by assuming that the channel is quasi-static over the interval . where is the integration interval of the correlator, and . Some remarks are now of interest. where is the decision variable for ATR. Unlike the ideal Rake receiver, which correlates the receive signal with noiseless template, the TR scheme uses the noisy reference signal as a template in one symbol case and the best estimated reference signal using (11) in the multi-symbol case. However, the TR system does not explicitly estimate the channel parameters and only requires the correlation coefficients , , , evaluated in (14). The global optimal value of can be obtained by using exhaustive search  or sphere decoding . However, the computational cost of the exhaustive search method grows exponentially with the number of symbols . Sphere decoding method searches all the lattice points inside a given radius and reduces the complexity of the exhaustive search method on average. However, the expected complexity of SDA is still exponential for fixed SNR and increases significantly when SNR is low . In this section, we develop an iterative MSTR detection algorithm by avoiding the high computational complexity of GLRT-based detectors (e.g., exhaustive search  and SDA ). Similar to the TR detection scheme, the proposed method first generates a reference template by using the initial symbol only, and then estimates the information symbols by correlating the reference template with the symbol waveforms. Furthermore, with the help of the information from multiple transmitted symbols, our method manages to suppress the reference template noise. However, our method also generates additional noise-cross-signal and noise-cross-noise terms which do not appear in the case of an ideal Rake receiver with perfect channel knowledge. where can be found in (12). This means that at the first step the estimated symbols are obtained by correlating the waveform corresponding to with the th symbol waveform. Hence, the BER performance is the same as that of the ATR in (19). A key factor that affects the method's performance and convergence is how to update the weights in each iteration. The ultimate goal of selecting the weights is to reduce BER while maintaining low computational complexity and requiring little extra knowledge (such as channel information). Here, we propose two types of rule for the choice of the weights in each iteration. which indicates that in (23). Also note that, the template is a scaled version of the GLRT template estimate given the detected symbols as shown in (11). where is the standard deviation of the random variable. In general, the larger the mean-standard deviation ratio, the better the BER performance. Thus, in the case of HD-MSTR, if more correct symbols are detected for the current iteration, during the next iteration, the reference template is improved and then the method potentially results in better BER performance. The iterative procedure runs back and forth until no symbol is changed or the maximum number of iterations is reached. An intuitive idea of the SD-MSTR detector is that the decision variable obtained in each iteration reflects the reliability of the detected symbol . The larger the value of , the more we can trust the accuracy of the detected symbol . Hence, the corresponding symbol deserves higher weight in the representation of the reference template for next iteration. where the two terms in (31) are the posterior probabilities of correct and erroneous detection of the symbol conditioned on the decision variable . If these probabilities are the same, that means it does not matter which decision we make. This represents the most unreliable case and the weight should be set to zero. The larger the probability of correct detection, the higher weight we should put on this decision. Note that the weight of the known reference symbol is set to 1, should be and ranges from indicating how much the averaged signal contributes to the final template depending on accuracy of the estimated symbol . where is the probability density function (pdf) of the standard normal distribution. where and can be found in (17) and (18) which require the frame energy and the noise power to evaluate and , but they are easy to estimate and store at the receiver side. Now, we can summarize our method in the following steps for one block symbol detection. Correlation matrix defined in (14), where , , the maximum number of iterations , channel statistics and for the SD-MSTR case. Obtain the decision variables by (24). Obtain the detected symbols by (26). Set for the HD-MSTR case or update the weights for based on (31), (35), (36) in the SD-MSTR case. If and goto Step 2, otherwise output and exit. The convergence rate also affects the practical value of the method (e.g., a system with a tight constraint on decoding delay) and the number of iterations affects the performance. These will be verified by the numerical simulation that the proposed method converges to the stable performance curve within a few iterations (usually iterations). Comparing with MSDD, we choose MSTR as the encoding scheme which allows the algorithm to detect symbol directly without any further processing. Instead of evaluating each iteration's reference template explicitly, the method computes the decision variables by linear combination of the correlation coefficients which can be computed in the first iteration and reused later. 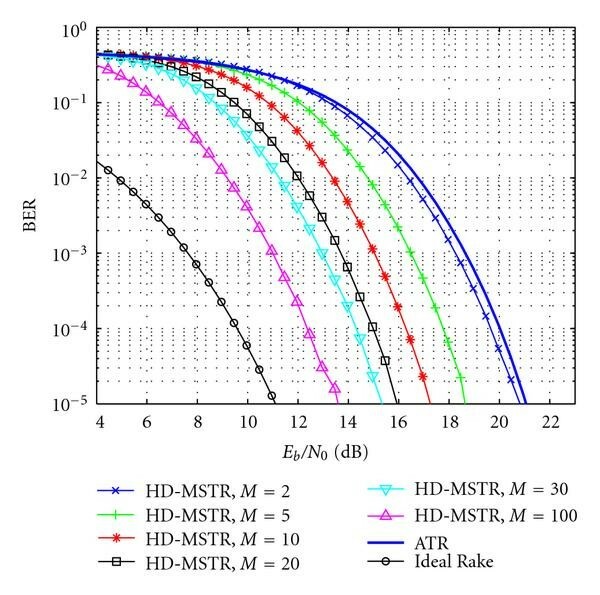 The HD-MSTR only requires the coefficients which is the same as the GLRT approach meanwhile the SD-MSTR requires some additional channel statistical information to update the weights for each iteration. For each iteration, Step 3 requires multiplications and additions to attain the decision variables for all symbols. In Step 4, sign operations are performed to obtain detected symbols. 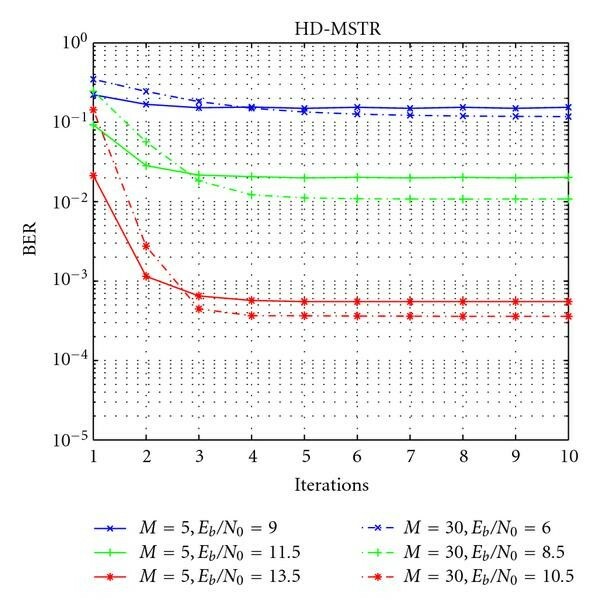 No arithmetic is required for HD-MSTR in Step 5, while the SD-MSTR performs times Gaussian pdf evaluation and needs additions and divisions to normalize weights. We can treat the computational costs of sign operation and Gaussian pdf evaluation as being constant, and then the computational complexity of the both detectors for each iteration is where is the block size. Note that the complexity of the proposed method is independent of the channel realizations whilst the computational complexity of SDA relies on the specific realization of channels and SNR. 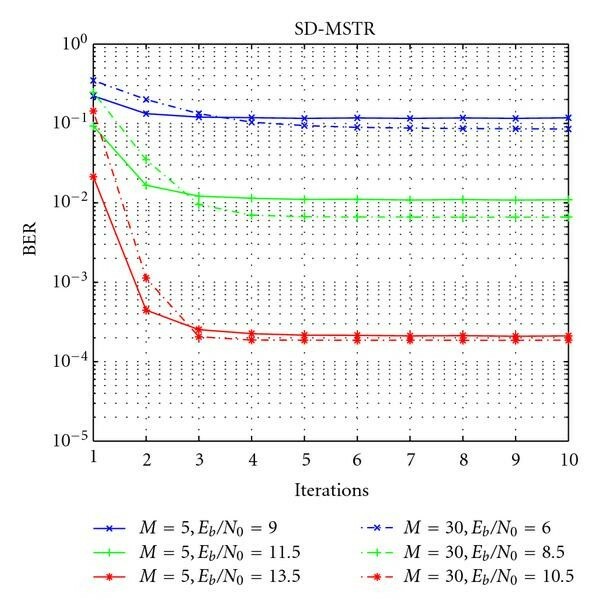 This section compares the BER performance of the proposed methods (HD-MSTR and SD-MSTR) and the MSTR based on exhaustive search (ES-MSTR) as benchmark. Two kinds of channel schemes are evaluated: one is a constant channel with fixed CIR parameters, and the other is a random channel based on Saleh and Valenzuela (SV) channel model. At the transmitter side, the pulse is the second derivative of a Gaussian function with normalized unit energy and pulse width . The number of frames per symbols is . For the UWB channel model, we employ the resolvable multipath assumption such that as studied in [12, 13, 19] and then in (18) can be approximated with the number of paths . In this simulation, is and the energy of impulse channel response (CIR) which means in this scheme. As we have shown in Section 3, if the number of symbols in one block is equal to or the maximum number of iterations is equal to , then the system outputs the same performance as ATR scheme in . Note that there is a gap between the ATR curve in the following figures and the one in . This is because the definition of frame energy in  is twice as the one of ours. In this subsection, we only consider single user case with for all . Multiuser case will be shown in next subsection. Figures 1 and 2 illustrate the BER results for for HD-MSTR and SD-MSTR, respectively. For HD-MSTR, the proposed method can obtain about gain relative to ATR in the case of and about gain if . With the increase of the number of symbols in one block, the performance of the proposed method grows monotonically but the improvement decelerates ( gain for and gain for ). In the same figure, we also depict the performance of the GLRT algorithm with exhaustive search (called ES-MSTR) as benchmarks. We also perform some simulations with very large which is intractable for classical methods. The system provides similar performance to that of the ideal Rake receiver, especially in high SNR range, where the difference is less than . BER of HD-MSTR for different M, K = 200, N f = 20, N = 10. BER of SD-MSTR for different M, K = 200, N f = 20, N = 10. Comparing the performance of HD-MSTR and SD-MSTR detectors in Figures 1 and 2, respectively, the difference is obvious when is small. The SD-MSTR outperforms the HD-MSTR, with about of SNR gain when and around gain when . The difference becomes trivial when is or larger. 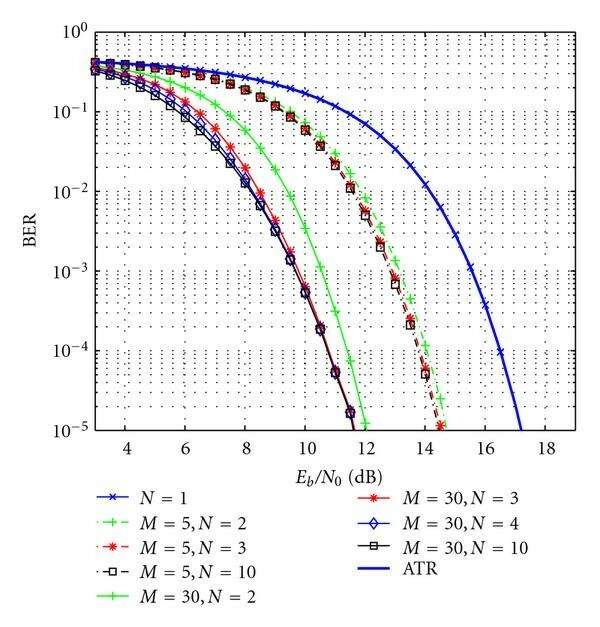 This indicates that the SD-MSTR method can offer additional advantages for low complexity UWB systems with small and but its advantage decreases with increasing . Bearing in mind that the SD-MSTR requires some statistical channel information ( , in (17) and (18)) and the Gaussian pdf calculation of the system, it is more likely that the simpler HD-MSTR algorithm would be implemented if is large. 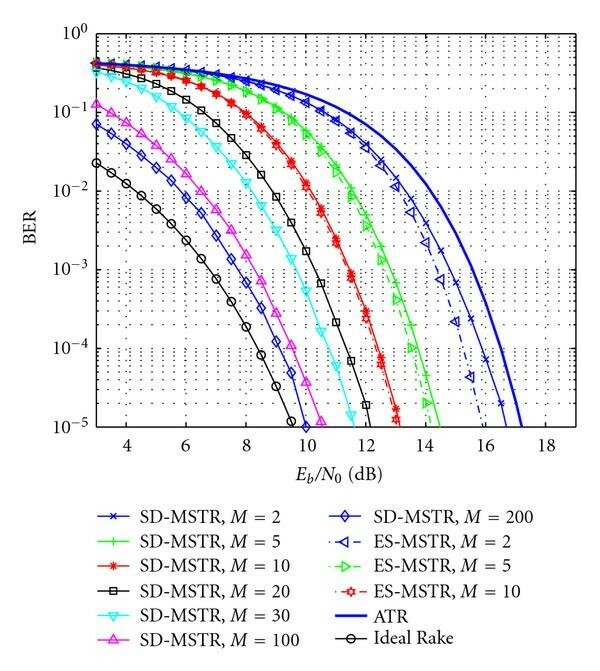 Compared with HD-MSTR and SD-MSTR, the ES-MSTR has an advantage when is small (if , about gain for HD-MSTR and for SD-MSTR) and the performance gap becomes smaller when is larger. When , the gap reduces to around for HD-MSTR case and about for the SD-MSTR case. This shows that with the increasing value of the difference between the optimal ES-MSTR method and our proposed methods decreases rapidly and that the gap can be ignored for a sufficient large . Furthermore, the ES-MSTR incurs much higher computational cost than our MSTR method. To answer the convergence question in Section 4.2, Figures 3, 4, 5, and 6 depict the BER values recorded in each iteration for . When there is only one iteration, the system reduces to classic ATR system and the BER result overlaps with that given by (19) (see Figures 3 and 4). The BER is improved significantly in the second iteration and just after about iterations, the algorithm reaches a stable BER performance curve with a small improvement in the th iteration at low SNRs. These show that our methods converge fast and it is practical for UWB systems. It is also noticed that the HD-MSTR and SD-MSTR show the similar convergence rates in the figures. BER of HD-MSTR for different iterations M = 5, 30, K = 200, N f = 20. BER of SD-MSTR for different iterations M = 5, 30, K = 200, N f = 20. 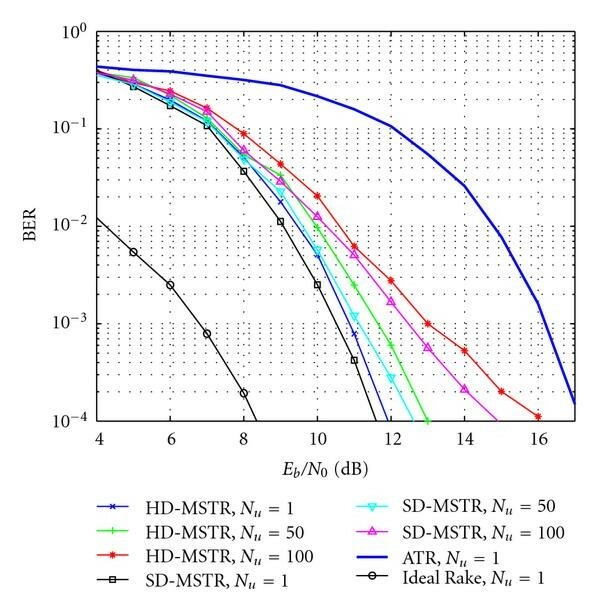 Convergence rate of HD-MSTR with M = 5, 30 in different SNR level. Convergence rate of SD-MSTR with M = 5, 30 in different SNR level. where models the double-sided Rayleigh distributed amplitudes with exponentially decaying profile. where is the average received energy per frame and the frame repetition factor is (to compare with ) while the integral interval is ns and the frame duration is ns to preclude the IFI. Figures 7 and 8 plot the performance curves for both HD-MSTR and SD-MSTR in single user scenario, respectively. For random channels, SD-MSTR shows about gain over the HD-MSTR for and retains the advantage even for large ( ). For HD-MSTR case, the algorithm achieves gain if and about gain if with respect to ATR. This means that with a few iterations, the algorithms efficiently exploit the multi-symbol benefits and yield a near optimal result. Furthermore, by avoiding searching the solution space which is computational complex, our iterative methods are easy to compute by adding up some correlation terms with different weights in (24). 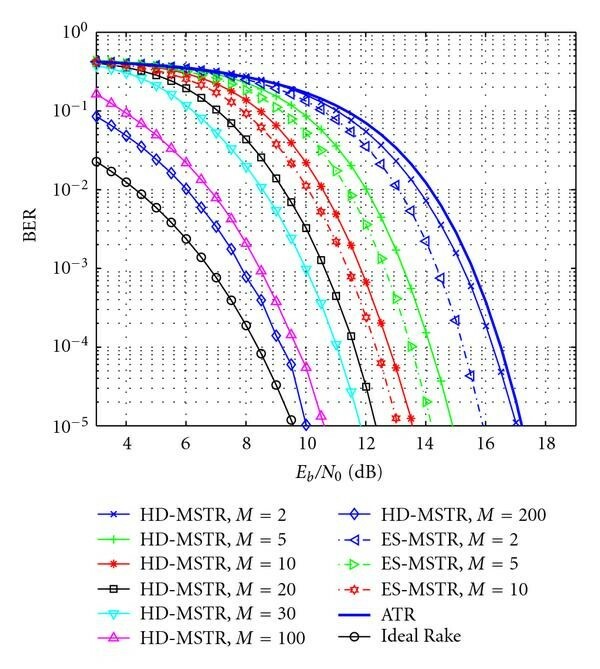 Average BER of HD-MSTR for different M over random channels, N = 10. Average BER of SD-MSTR for different M over random channels, N = 10. Furthermore, when and BER = , there is about gap between the ideal Rake receiver and our algorithm. As we expected, the performance over random channels is worse than the one with constant channels. In this subsection, we consider the performance of our algorithms in the presence of multiple access interference (MAI). In the case of MAI, the chip interval is ns and the TH codes are randomly generated in the range where . Unlike the single user scenario, we do not consider the attenuation of each individual channel and assume ideal power control among nodes such that the received energy from each interfering user is the same. Figure 9 displays the BER result in this MAI scenario. At BER , the HD-MSTR experiences only around performance degradation for comparing with corresponding single user scenario where is the number of users. In addition, there is less than gap between the multiple users HD-MSTR and single user ideal Rake receiver. For the SD-MSTR case, the detector outperforms the HD-MSTR detector with more than gain in both single and multiple users scenario. In summary, our proposed detectors demonstrate significant robustness in the present of the MAI effects. 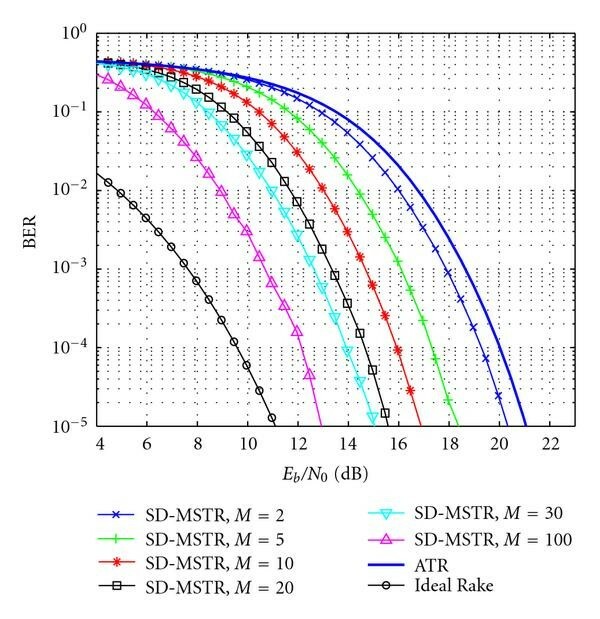 BER of HD-MSTR and SD-MSTR for M = 30, N = 10, and different N u over random channels. In this paper, we propose fast detection methods for MSTR transmissions. The proposed MSTR detectors obtain the decision variables by summing up the correlation of different symbol waveforms, each properly weighted by the reliability of detected symbols and iteratively updating the weights and detected symbols. With different updating methods for the weights, two detectors are proposed: Hard Decision for MSTR (HD-MSTR) detector and Soft Decision for MSTR (SD-MSTR) detector, where HD-MSTR obtains the template based only on the previous detected symbols, while SD-MSTR constructs the template with additional information from the decision variables. Enhanced BER performance relative to the ATR scheme and the fast convergence property of these detectors are shown by the simulation results. Due to its simplicity, low computational complexity and near optimal performance for , the method is promising for realistic UWB applications. Part of this work is supported by the Georgia Tech Ultrawideband Center of Excellence (http://www.uwbtech.gatech.edu/). The authors would like to thank the anonymous reviewers and the guest editor for their helpful comments which improved the quality of this paper.